I’m celebrating. 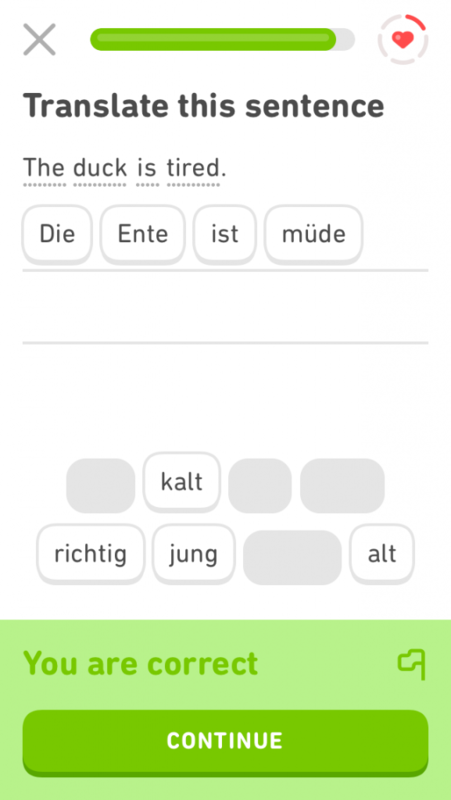 I’ve just completed a 21-day streak with Duolingo, a language-learning app that is reminding me of the German I was taught at school. 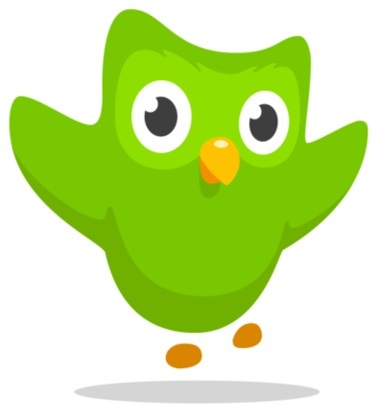 I’m a bit of a late adopter, but having finally got started, I can now see what Duolingo’s other 300 million users worldwide are raving about. So far it’s easy, fun and the learning has a pleasing element of competition. It’s relatively undemanding of my time, asking just ten minutes a day, but because I’m enjoying it so much, I’ve been averaging half an hour. 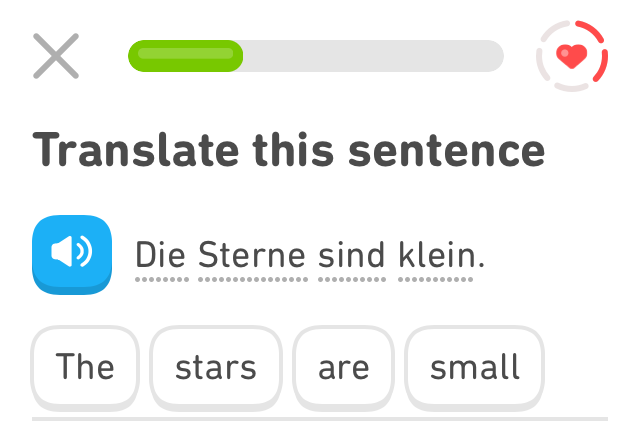 I’m actually quite surprised by how quickly my German is coming back. My German teacher must have done something right. She was a tiny little woman who stank of fags and who was prone to easy tears, but I was fond of her. And her German was impeccable; it was her native tongue. Frau Greig (she married a Scot) had grown up in East Germany and escaped over the border, smuggled in the boot of a car. I have a vague memory of her telling us that she still had family in the East, but there was no communication with them. I wish, at 14, that I’d realised how fascinating her story was. I’d give anything to talk to her now. Interesting people are so often wasted on the young… But I am digressing. Back to vocabulary. If you’d asked me three weeks ago to translate ‘The lazy ducks are eating the small beetles’, I’d have drawn a blank. Similarly, ‘That bear is eating the strawberries.’ But now the phrases are not only tripping off my tongue, I can write them as well. They’ll be invaluable on next year’s ski trip to Austria. Three weeks in and I’m hooked. There’s a wee green owl that pops its head round my screen to tell me how well I’m doing (ten answers without a mistake? I glow with pride!) and for every level I complete I earn ‘lingots’ that can be spent on extra lessons like ‘How to flirt’, or on tests to leapfrog me to the next stage. That green owl is a mine of interesting facts. For example, in Sweden the most popular language being studied is Swedish, testament to the number of refugees the country has welcomed. And there are more people learning Irish Gaelic than the entire population of Ireland. Irish is popular in both Ireland and America, and threatened languages, like Hawaiian and Navajo, are being revived thanks, in part, to Duolingo. There are 330, 000 users learning Welsh, and – although I doubt many will be serious scholars – 650,000 learning High Valyrian, a language from Game of Thrones. All of which has got me thinking – where is Gaelic? There are 32 languages available for English speakers to learn but Scottish Gaelic is not one of them. Is High Valyrian really more valuable than Gaelic? Is Klingon? It’s an option too. I’d be keen to dip a toe into learning Gaelic, and Duolingo would be an ideal way to get started. It requires nothing more from me than a little time each day. There’s no need to commit to classes and, if I can put up with adverts, it’s free. I can do a lesson while waiting for a dental appointment or while the kettle boils. Duolingo is always in my pocket. In German, it’s Frau Greig, my old textbooks and vocabulary jotters and the school’s language lab all rolled into one. There’s no embarrassment and no public humiliation if I get an answer wrong. Languages are meant to be spoken; Gaelic is no exception. The lyrical beauty of the words draws me in, but I have no idea what they mean, or where to start with pronunciation. So even with Gaelic road signs and public notices all around me, I’m reluctant to try. Is there anyone who can help get this underway? New languages can be added to the site if there are volunteers willing to create the course. If the Scottish Government are really as keen as they claim to be to promote the Gaelic language, I hope they’re already in discussions. This post first appeared in Seven Days, published by SPP and issued with The Inverness Courier, The Northern Scot and four other titles across the north of Scotland, week ended 1st February 2019.